Behavioral Interview Questions are the best way for Hiring Managers to assess whether or not you are going to be the right fit for the position. 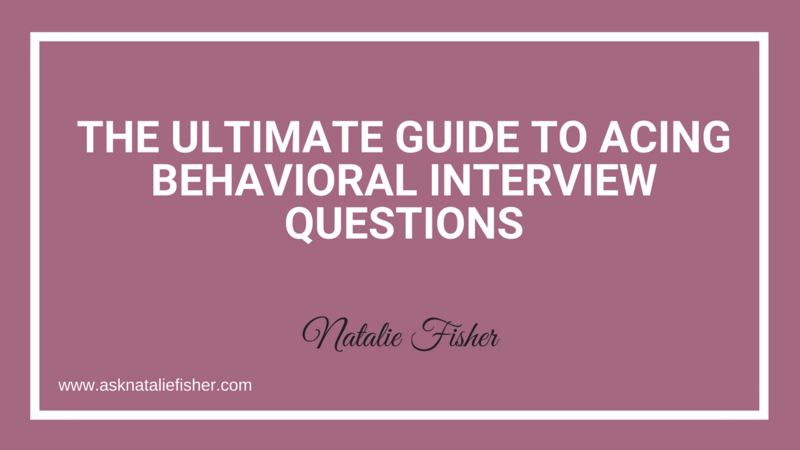 Behavioral Interview Questions are inevitably going to come up in every interview and that’s why I created this post. To help you answer them with ease. This is the most comprehensive in-depth post on Behavioral Interview Questions you will find on the internet. I’m an HR Professional, and I’ve been in over 100 interviews. I’ve seen thousands of good and bad examples of answers to Behavioral Interview Questions many of which I will share with you in this post. Think about this. If someone asked you how you would react IF you had to fight a bear.. You’d tell a story of what you would (hypothetically) do IF you were in that situation… However if you’ve never fought a bear before (which is likely the case, although if you have I’d love to hear that story). You wouldn’t have any way of knowing how you would realistically respond. That’s why interviewers prefer to ask you to tell about previous examples of things that have already happened. And that’s why the behavioral interview questions are phrased in the form of “Tell Me About a Time When…” Or “Give me an example of a time when…” Those are called Behavioral Interview Question prompts, and they are the most widely used and trusted interview questions. Behavioral Interview Questions are also a great opportunity to ace the interview because most candidates don’t know how to navigate them in a way that makes them stand out. As a hiring manager who has conducted and sat in on over 100 interviews and counting, I’ve seen every mistake in the book. If candidates don’t have a story prepared quite often they will answer with something vague and non descriptive. It doesn’t say anything about the candidate, and it doesn’t give anything for the hiring manager to go on. For example: I asked a candidate who was interviewing for an HR role the following Behavioral Interview Question: “Tell me about a time you dealt with confidential information” Her response was simply “All the time, every day”. That’s an example of an answer that doesn’t provide any information and leaves a Hiring Manager wondering if the candidate has actually handled confidential information or if they are just saying they did. It is easy to make a lot of claims, but without a story to back up or prove your claims. You are in the same camp as every other candidate. When answering Behavioral Interview Questions being specific is the most important thing we can do. Specificity allows for the Hiring Manager to understand much more about you as a candidate and as a person. The stories that you choose to tell will be very unique to you. The stories you tell should show your personality and talk about how you did things differently than how someone else would have in the same situation. We get into what I mean in the many many examples in this post and you will see the specificity of how your answers should sound to be the most effective in a behavioral interview. Not telling a clear or concise story, (telling a story that is difficult to follow or difficult to understand). This is probably the worst of all mistakes in an interview that you could make. Because when you confuse people you lose people. A confused Hiring Manager will be left mentally tired and won’t want to continue speaking with you, so it’s important that you map out your stories beforehand so that you can be sure that they make sense. In this post I will also cover the 6 main areas that will be focused on during most interviews and how you can apply the examples in this post to each of those categories. This one happened the other day in an interview. I asked a candidate to tell me about a time she had made a mistake. She ended up telling me a story about when someone else had made a mistake, which missed the entire point of the question. So make sure that your story relates to the question and answers it as directly as possible. If you don’t have a story of a time you disagreed with your boss (for example) address that, and state to the hiring manager that you can tell them about a time when you disagreed with a co-worker or a customer and how you handled it, but because of the nature of your role and the fact that you worked quite independently, you don’t have an example of a disagreement with your boss. Addressing the fact that you’re going to give them a slightly different answer is way better than going completely off topic and not addressing it. So how can you ace these questions in a way that makes you stand out, be remembered and be the candidate of choice? If you’d like 10 more examples including fill in the blank exercises for each one download the FREE Ultimate Guide here which also includes 25 questions to ask yourself to help you come up with your own unique stories to help you rock that behavioral interview. Why is this behavioral interview question asked? They want to see how you are able to think resourcefully, think on your feet when something comes your way that seems impossible—so, something that you need to get done in an impossible amount of time. How do you work through it, and how do you figure it out? So, we start with how to answer this question, which is how to tell a story effectively. We use the S.A.R.I. (STAR Interview Method) formula—which is Situation, Action, Result, and Interesting features (which are important)—to paint a clear picture of where you want to go with your story answer. For example, you are asked to do a presentation, and you had to get it done the next day. So, the person that had to do the presentation was sick, and you had to step in for them and have it ready to present the next day. You didn’t have anything ready. You didn’t really know very much about the topic, but this was assigned to you and you needed to step up. What do you do? For example: You figure out exactly what needed to be done to make this presentation a success, you learned the goal of the presentation and from that you learned you needed to: a) Do the research b) do the first draft, c) practise it to make sure it flowed, and you had to do this all before the next day. You worked out it was going to take you at least six hours, and you’ve got to do it in the morning for a huge team of executives who are going to be ready for your presentation. So, what do you do next? One of the actions you may have taken was gotten some help with some of the research from a couple of your coworkers. This would cut down the time a lot. Another thing might have been that you could have used some previous presentation that you had to put some of the information into this one and make it work. Those are two good examples of some actions that you took that were resourceful and helped you get the result that you needed. Step 2. was recruiting help and existing resources to get it done. Step 3. was getting to work and doing your best. In this situation someone else may have panicked, broken down and cried, given up and decided this was not possible. Step 3: Describe the Result. You want to tell a happy ending in your story, so you want to talk about how it came together well for you. The presentation went well, and you were able to get it all done in time, and nobody noticed that you were assigned last minute. That’s the goal; that’s what we want, and that’s how you essentially tell the story with a series of steps that the listener is easily able to follow. Now, interesting features are a bonus, but they really add interest to the story. So, for example, the interesting features in this story could be highlighting the learning, which is what people love to hear about— what you learned. In this situation, it might be that asking for help was super important to you, and having a good relationship with your co-workers was great because you were able to count on them just as they would be able to count on you if they were in a similar situation (This also proves you’re a same team player so it’s a bonus to add something like this in!). It’s great when you work with people that you can count on to assist you. In this case they were so helpful and willing to assist with this research and to be a test audience for you when you practiced and gave you feedback. This demonstrates your people skills, your resourceful skills and generally your ability to manage something that was really, really, really hard to do in such a short amount of time using the power of your relationships as well as your resourcefulness. Behavioural interview questions around decision making come up a lot. So, why is this question asked? The question is around how you had to make a difficult decision, and you didn’t have all the information that you needed, so a time when your decision was unclear, and there was no one around to ask, your manager wasn’t available. So, what did you do? Basically, there is no way for you to be sure you were doing the right thing here. You had to make the call on your own and use your own judgment. How did you handle it? And how did you decide what the right call was? What’s the point of this question? It’s to see how resourceful you can be and to get an insight on your thought process. In most situations, people, when they have to make a hard decision, and there’s nowhere to turn, they panic, and that’s a normal response. So, how could you answer this question? We’re going to answer it, again, by telling the story and using the S.A.R.I. (STAR Interview Method) formula. If you’re not familiar with the S.A.R.I formula by now, it is Situation, Action, Result, and Interesting features. The S.A.R.I. (STAR Interview Method) formula comes in many forms. Sometimes it’s called S.A.R. Sometimes it’s called S.T.A.R., which stands for Situation or Task, Action, Result. It’s all the same. So, you want to tell a memorable and interesting story that includes just enough detail to give the interviewer a good idea of the situation you were in. So, let’s get into it. So, set up the situation, starting with what was difficult about the decision and how you stayed calm and were able to think your way through it. What was the outcome that you were focused on getting, and how did you go about getting it? What were the actions that you took to get to the specific outcome that you were going for? You can talk about one to three actions here. This is the meat of your answer. You want to focus most of your time here. You want to focus specifically on what YOU did to get to the result you wanted. What happened in the end? How did the situation turn out? A good story has to have a happy ending, so what you want to do is make sure that you wrap it up neatly with what happened and how you got there. Don’t leave them wondering. This question is designed to see how you approach a stalemate, a draw, a situation where there’s no clear move because you are at an impasse. You disagree, so what do you do next? This is really important. They want to know how you are going to react when you get into a disagreement with somebody or a group. When you a different opinion to someone else, how do you communicate with that person to get to a resolution? Communication is the #1 skill that you’re going to demonstrate when you answer this question. So, as all these questions go, you answer it by telling a story, and you use the S.A.R.I. (STAR Interview Method) formula. If you’re not familiar with the S.A.R.I. (STAR Interview Method) formula, it stands for Situation, Action, Result, and (as a bonus) Interesting features. The S.A.R.I. (STAR Interview Method) formula comes in many forms. It’s mentioned in other online resources as the S.T.A.R. formula or the S.A.R. formula, which is essentially the same thing. You want to tell a memorable story that’s interesting to listen to and includes enough detail to paint a picture. So, let’s get into it. So, the story should be pretty concise. You want to keep it short and sweet, so set up the situation, set the stage. What was the disagreement about, and who was it with? Why was it important? Why did you want to pursue this disagreement? Why didn’t you just let it go and say, “Whatever, it’s OK”? Why did you see this as an important thing? Step 2: What did you do? How did you communicate to get through the disagreement? How did you approach the topic? What communication strategies did you use? So, here is where you tell them the ending. How did it work out? What was the end result? Make an effort to keep the story concise. It’s very easy to off on a tangent, especially if you haven’t prepared beforehand, so keep it focused, and tell the result. Every story needs a happy ending, so make sure you choose something that makes you sound awesome, and make it positive. Anything you learned here? Or did you take away from this experience any nuggets of wisdom to share? Basically, anything that makes the story more interesting and more fun to listen to and shows how insightful you can be. Normally, when interviewers ask these types of questions, especially this one, it comes from the theory that your approach to failure defines your success. The question is designed to see how you approach failure, how you think about it, and what your attitude towards failure is. How do we answer this question specifically? So, you’re going to answer it by telling a story, and with that story, we’re going to use a formula. It’s called the S.A.R.I. (STAR Interview Method) formula, which we’ll go through in this post. S.A.R.I. (STAR Interview Method) stands for: Situation, Action, Result, and (as a bonus) Interesting features. The S.A.R.I. (STAR Interview Method) formula is mentioned in many posts and many places online, I’m sure, and it comes from the same place as the S.A.R. formula or the S.T.A.R. formula, which are essentially the same. So, S.T.A.R. is: Situation, Task, Action, Result. And S.A.R. is: Situation, Action, Result. So, now that you know about that, let’s get right into it. So, here is where you’re going to set the stage and paint a picture. So, you’re going to explain what happened, why you failed, and why you thought this was a failure. So, one person might have thought something was a failure, and another person might not have seen it that way, so you’re going to explain what the problem was. This is where the meat of your answer comes in. So, what did you do? Talk about the action that you took—and specifically the action that YOU took. Don’t say “we” or “us.” They want to know what YOU did. Top candidates own up to their part in a failure, and then they come up with options on how to fix it and how to move forward quickly, so present the options that you suggested to fix it, and tell them which one you went with and why. Explain how it worked out in the end. What happened as a result of your actions? Every story is not complete without a happy ending, so make sure it’s something positive you choose to tell the story about, and the story ends well. This is a bonus. I know this is all hard to remember all together, but… Interesting features. So, this is what really puts the icing on the cake. Zero in on learning, talk about resources you used to get the results that you did—anything that adds interest to the story and makes the story more fun to listen to. For example, an interesting feature that you can use to wrap it up is an insightful comment on how you view failure. These make good interesting features and are nuggets of wisdom that highlight how you learn and grow. They want to see how you handle mistakes. They want to see how you see mistakes, what your overall attitude is towards them. The question is designed to get inside your head and view how you handle screw-ups and how you think about them and how you internalise them. The S.A.R.I. (STAR Interview Method) formula, if you haven’t heard of it before, it stands for: Situation, Action, Result, and Interesting features. The formula comes in many different forms, so you may have heard of the S.T.A.R. interview formula or the S.A.R. formula, and it’s basically all the same: Situation, Task, Action and Result. So, now that you know about that, in my head, I always think of it as a story because it can be hard to remember all these pieces. A story always has a beginning, where you introduce what the task or the situation is, the middle has the meat of the story or the action happens—literally where the action took place, and the hero comes in and saves the day—and then the ending, which is the result, where you wrap it up, and you tell how the story ended happily. Interesting features sprinkled in are always great because they make you more interesting, and they add appeal to your answer, and they make you memorable. So, how do you answer this one? So, setting the stage: You want to present the mistake that you made. For example—we’re going to use a specific example—say you forgot to invite someone to a meeting that was a key decision maker, and you scheduled the meeting, and you forgot to invite this key person. This is the action portion—the meat of the story. What action did you take? The first thing that I always say is that I own up to the mistake. That’s what top candidates always do. No excuses. Flat out “This is what happened, and this was my oversight, and this is what I plan to do about it.” So, with the action, you can talk about how you proceeded to fix it. What options did you choose? You go through the scenario of what you did, and you describe exactly your actions. You want to be careful to only talk about what you did because if you say “we” or “us,” that kind of dilutes your story, and you want to make sure you’re talking about you the whole time because that’s what they care about. So, what was the end result? Let them know how it turned out, how you handled it, how you fixed it, and how it ended. So, don’t shy away from talking about your mistakes. Embrace them, own them, and make sure you tell them how they ended up and how you were able to fix them and what you learned. That wraps up this one. What is your attitude towards when you make a mistake? How do you deal with things when they don’t go perfectly? You want to show maturity in your answer and that you got to the facts—you just decided what you were going to do, looked at the situation and took the best course of action that you could to fix it. You want to show that you took responsibility, and you owned up to it, and you want to highlight what you learned in the end. This question illustrates your ability to learn and not take things personally. While being open to feedback is not easy for most people, they want to see that you can take it in stride, analyse it and make changes based on the criticism if it makes sense to do so. Good candidates don’t take it personally. A good answer will show emotional maturity, adaptability and open-mindedness. So, what I say… I actually just come right out and say I don’t take it personally. I strongly believe that that’s something that’s really helped me out a lot in interviews is to just be honest and say, “I don’t take the criticism personally.” They want to see that you not only take it in stride but that you don’t get defensive or blame other people, but rather, you take it in, and you analyse it, and you use it to improve. How do you answer this specifically, step by step? Here’s where you set the stage. For example, you worked on project X, and you received criticism that said you should do something different. So, you describe the criticism that you received, and that’s setting the stage. Say you were planning an event, and they told you that something at the event didn’t go very well. So, the interviewers asking you this Behavioral Interview Question, they want to see how you handle when you have a problem with somebody in your group or somebody that you work with. So, things like this come up at work all the time, where you don’t agree with someone, or you’re trying to get someone to do something for you, and you can’t because they don’t want to. So, how do you answer this Behavioral Interview Question? You may guess that we’re going to tell a story. So, using the S.A.R.I. (STAR Interview Method) formula, which we’ll go through here… S.A.R.I. (STAR Interview Method) means: Situation, Action, Result, Interesting features. And how you answer it is tell the story with the beginning, middle and end. So, the story should be memorable, interesting and include enough detail to paint a picture for the interviewer. So, they want to see that you don’t get personal or caught up in workplace drama. They want to see that you deal with the situation at hand diplomatically and are focused on the outcome that you want. It’s easy to get caught up in emotions of anger, frustration. They want to see that you just get to the point and diplomatically deal with the problem. So, let’s talk about the key actions that you would take and you might answer the question. This is the situation, where you describe what’s going on. So, an example here might be dealing with a lovely co-worker, who is a very nice person but who isn’t deadline-oriented, so they just don’t pay attention to deadlines, let’s say. Say you were working with this person, and you were working on an important thing that needed to be completed by a certain day, and he wasn’t meeting deadlines, and you were sure he wasn’t going to meet this one coming up. So, that’s how you set the stage. So, the action here, for example, might be that you approached your co-worker and figured out what was going on, and you offered to help him. So, then you would explain what happened. For example, when you spoke to your co-worker, he mentioned that he was overworked, he was frustrated, and he didn’t have time to do everything that was expected of him. So, how you solved the situation was you offered to help him, and you offered to get some projects off of his plate by speaking to his manager with him so that he could meet the deadline that you had needed met. And Step 4: What did you learn? This is where the interesting features come in. So, you learned, for example, that to seek to understand first, to seek to help second… So, not to go in with anger or frustration, which is what most people would probably do when someone wasn’t doing what they needed done. So, instead of this, you took a different approach, which worked out very well because your co-worker was appreciative you understood him, and you were able to get the project completed on time. OK, why is this question asked? So, the interviewers asking you this question, they want to see how you handle when you have a problem with somebody in your group or somebody that you work with. So, things like this come up at work all the time, where you don’t agree with someone, or you’re trying to get someone to do something for you, and you can’t because they don’t want to. So, how do you answer this question? You may guess that we’re going to tell a story. So, using the S.A.R.I. formula, which we’ll go through here… S.A.R.I. means: Situation, Action, Result, Interesting features. And how you answer it is tell the story with the beginning, middle and end. So, the story should be memorable, interesting and include enough detail to paint a picture for the interviewer. They want to see how you directed somebody or a group of people or led a team, or how you turned around a situation that wasn’t doing well. So, for the purpose of this post, we are going to use the S.A.R.I. (STAR Interview Method) and a ton of examples. If you’re not familiar with the S.A.R.I. (STAR Interview Method) formula, it stands for Situation, Action, Result and Interesting features. So, to tell a complete story, you need a beginning, a middle and an end, and the story should be fun and interesting to listen to, so that’s what we’re going to do here. You should paint a clear picture with your story. So, say that you were assigned to a new team, and this team wasn’t doing very well, and they weren’t very happy because they had a lot of changes happen in their department in the last little while, so you were dealing with a disgruntled team, and you just come into the situation. So, that’s how you set the stage. Step 2 is the action. So, what action did you take? What did you do? It’s extremely important here that you talk about specifically what YOU did and not what “we” did or how “we” proceeded because that doesn’t matter. They just want to know about you specifically. So, continuing with our example, say some of the actions that you may have taken were scheduling one-on-one meetings with each person on the team, where you asked them some questions around what they thought was going on with the team, what was holding them back, and what each person thought that you should do as their new manager/team lead coming in to fix the situation. And you also asked them what they would like to happen, what their ideal outcome would be. So, here is where you talk about your happy ending. For example, in this example, say you took action on the main thing the team had mentioned that was holding them back. Say you talked to everyone on the team, and they all kind of mentioned the same key thing, and you now keep one-on-one meetings weekly on the calendar to make sure that the team stays strong and are communicating with you, and everyone is a lot happier now, and you’re proud of the work the team did and of the turnaround. So, that would be an example of a great result with a happy. So, here you can talk about things like servant leadership, or you can mention resources that we’ve used in the past, books you’ve read, employee engagement nuggets of wisdom. It can be anything that you found interesting looking back at the situation and what really helped you turn it around. An example of leadership skills and how they were demonstrated. Now, if you don’t have an example like this, don’t worry. You don’t have to lead a group of soldiers into battle to have a good story about leadership. It can start with just one person. If you want some help coming up with your own stories with these types of questions, I’ve got you covered in the downloadable guide you can click below to get. And what you’ll get is top-ten examples of stories that I’ve used in my own interviewing, and it’s taken a long time to come up with all of these stories. It is challenging at first, so you do need to take some time to prepare them and think about what your greatest career stories are. In the guide, you’ll also get the S.A.R.I. (STAR Interview Method) formula breakdown, step-by-step psychologically why it works, and fill-in-the-blank templates for each question. So, you’ll be able to fill in the blanks. You’ll just need to come up with your own stories. And if you are still getting stuck because you can’t think of your own stories very quickly, I’ve also included 25 questions that you can ask yourself to come up with your stories much quicker and more effectively. You’ll get all of this in a beautifully designed workbook prepared specifically for you to prepare for your interviews. 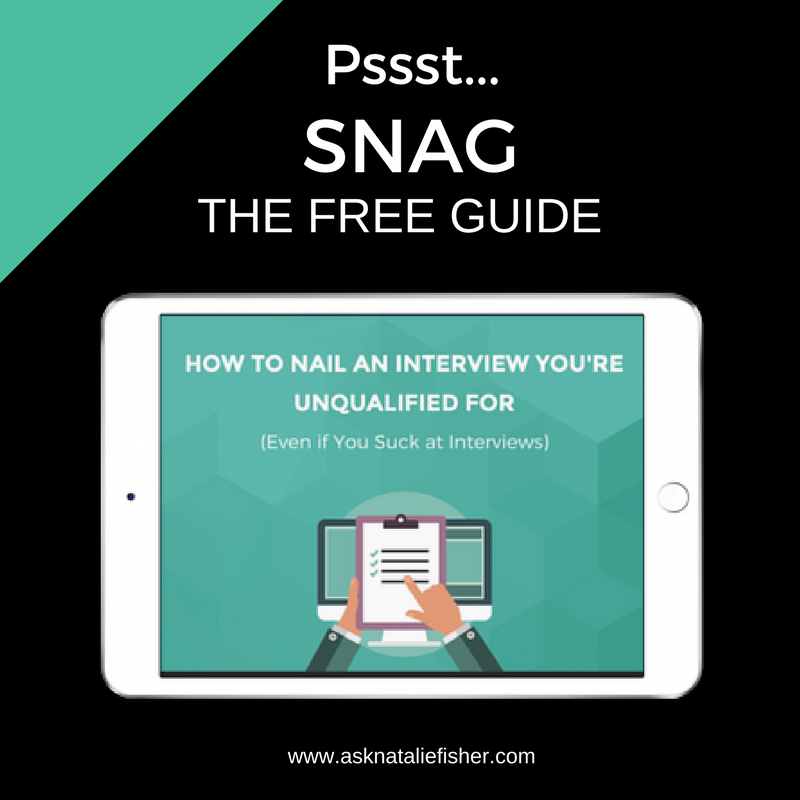 By the end of working through this guide, you’ll be totally ready for any situational interview questions that comes your way and any of those tough questions that you may have gotten stuck on in the past. Conflict with people is inevitable in the workplace, with people having different communication styles and personalities it’s not something you will get around if you’re working with other people. So the interviewer really wants to know HOW you navigate it when someone isn’t peachy all the time or they might be difficult to communicate with or unwilling to cooperate. This is an obstacle that gets in the way of productivity and they want to hear about how you’ve dealt with it in the past. When did you turn someone’s Frown Upside Down? (Cheesy I know). I was working with the development team on the company website. I needed to guide them with what we wanted and they needed to do it. The head developer who needed to make the changes was a bit difficult to communicate with, and since there was a lot of communication needed between the two of us to get the job done successfully I knew we needed to do something about it. I asked him how he preferred me to communicate with him? I.E. via email or in person, on the phone etc.? I asked him how much time he would ideally like for requests, since I wanted to consider his needs when working with him. I asked him if there was anything else I could do to make working together easier for him. So the Result was: He didn’t respond well. He wanted to communicate via email but he was really non – responsive. He wanted a ton of notice for anything which was not always possible, he said there was nothing I could to make working together easier. He was really just grumpy and unhappy in general. He was a great developer though and I knew I couldn’t give up because we would just be starting again from square one. We had a job to do together here. So 2nd action I took was, asking him what was going on. I just got really real with him, just went and sat with him and brought him a coffee and said: “What’s going on with you? Is everything ok?” I feel like our working relationship could be better and I’d like to make sure that you’re ok because you don’t seem like yourself? He broke down and told me that he was overwhelmed. He was having issues at home with his wife snoring and he couldn’t sleep properly, he said he hadn’t slept in weeks, he had big backlogs of work and high expectations on him to do a lot in short amounts of time, he apologized for giving me the cold shoulder and being so difficult to work with. He appreciated my concern and wanted to make a better effort to let me know where he was at with things. Highlight anything interesting about the story – So for me the learning here was, that this person was actually not a difficult person to communicate with under normal circumstances. But the thing that was causing him the problem was 2 fold, both his lack of sleep and a lot of work was making him cranky and snappy. His communication skills were fine the problem went deeper than what was on the surface. Can you think of a time you had an opportunity break down the communication barriers with someone? How did it turn out! It’s to see what ‘creativity’ in the workplace means to you? Where did you take something to the next level and give it a creative flare that otherwise would have been a super boring presentation or boring article, or slide deck? What have you done that was creative that benefited someone else? The opposite of creative is streamlined, process driven, instructions. There’s a time and place for that too and there’s nothing wrong with it, but if they’re asking this question it means they want to know what creativity you can bring to the table in the role! You want to tell a powerful story that paints a good picture of the situation, how you rose to the challenge and the end result. I was asked to do a presentation for the company on behalf of my department. The other departments did their presentations and I could see that people would zone out quite frequently and not really be engaged in the presentation. So for our presentation I saw it as an opportunity to get creative and I used a few different methods! What were the actions that you took and what outcome did they lead to? So for example: Action: I decided that including members of the audience was a great way to do this, as people seeing their peers go up in front of everyone was more interesting than just me talking to them for a half hour. So I planned out a few exercises for people to come up and I would ask them a few questions. I also played a couple of funny post clips that got people laughing. All were related to my subject matter and made my points well. This was instead of just having powerpoint slides with text on them. So the Result was: That I got a very high score on my presentation. Afterwards everyone rated the value of each department’s presentation and mine was given the highest score of 4.8 out of 5. I was asked if I would be willing to do the same presentation with a few tweaks at the next User conference. I was super excited that the risk I took paid off and that the audience received the presentation so well. Highlight anything interesting about the story – So for me here was that engagement levels are highly controllable. So by trying out a few different things in a new presentation in front of internal staff members I was able to see what worked well. Then I can imply the same techniques for doing customer presentations later on and I was given more opportunities to do so because of this creative decision. Can you think of a time you had an opportunity to be creative with something that otherwise would have been vanilla and just boring? This question is to find out how flexible you are, (not physically flexible) although yoga is really good for you. But I’m talking about mentally flexible, and this is really tough for many people. So they want you to tell them about a time when you were asked to do something and perhaps all your hard work work wasn’t’ needed anymore, and something changed? Have you ever been there? It’s to see how you deal with things changing on the fly, how resilient you are in other words. So in most situations people when they are asked to change directions, from what they’re doing, they get frustrated, mad, they get into a bad state because they feel like they wasted time, and their time wasn’t appreciated and their work is wasted. You want to tell an impactful story that paints a good picture of the situation, how you rose to the challenge and the end result. I was working on planning a large corporate retreat for the company executives, we had a lot of it already planned, flights and accommodation were booked etc. Then suddenly the President of the company had a sudden important meeting come up overseas and the retreat needed to be postponed/cancelled immediately. What were the actions that you took and what outcome did they lead to? So for example: Action: I said, No problem I’ll get on this right away! immediately cancelled the flights, meeting space and hotel bookings trying to get as much money back or credits for future use as possible, got credits for what what I could so we wouldn’t lose too much money and changed the necessary arrangements. I was able to negotiate some extra credit from the resort hotel, as I let them know that we were going to be re-booking in the future with them, and that if they helped us out on this occasion it would mean that we’d be more likely to use them for future retreats too. (In other words, giving us a break here would pay off for them in the future). They appreciated the fact that I was able to salvage some of the funds spent on the retreat and negotiate extra credit, it was before the deadline so cancelling the reservation still were able to recuperate some of our money back for the company. If I had waited even one more day to cancel, this wouldn’t have been possible. I looked at it more of a learning experience than an inconvenience, I realize that things happen in life that no one can predict and are sometimes unavoidable. Getting frustrated and upset just takes away the energy needed to handle things efficiently. So I just roll with the punches and get what needs to be done, done, even at a moment’s notice! What’s your go to response when faced with switching gears without warning? How do you deal unexpected changes happen suddenly? How do you move forward and how do you feel about it? They would like to see how you’re different from the average person who’s up for this job. Anyone can ‘do the job’ but what will YOU do that’s special? What will you add? And they want you to give an example of that here. The question is designed to see a) if you can think of a time you went above and beyond and b) to see what going above and beyond means to you and how you describe it. How do you answer the question? We’ll use The STAR Interview Method Formula which we’ll go through here. STAR Interview Method Stands for Situation Action Result and Interesting Features. The STAR Interview Method Formula stands for (Situation/Task, Action, Result & Interesting Features) The formula comes in many forms. Some people call it SAR some people call it STAR but it’s essentially the same thing. STEP 1: Situation Set the stage and paint a picture. Describe the situation/job you were in. For example: I was working as a receptionist a busy downtown law firm and I knew an important potential client was coming in for a meeting later on that day. The firm owner asked me to make sure this gentleman was given the VIP treatment when he arrived. I prepared carefully for this client, I researched him online and I found out what his interests were, so that while he waited we could have a good interaction with him. I also asked around and found out that he really likes to drink a certain type of coffee. So when he arrived I was ready with a cup of that specific hazelnut coffee that he liked. Every story isn’t complete without a happy ending so make sure it is something positive you choose to talk about in your story. The result in this case was amazing. He was over the moon impressed. I could tell by the look on his face as he went into the meeting, that he was not expecting such special treatment. He thanked me, smiled and shook my hand. As a result the firm landed the account! Zero in on learning, talk about resources you used to get the result you did, anything that adds interest to the story and makes the story more fun to hear. For example for the interesting feature, the example would be: I learned that taking a little extra time to make sure someone feels special goes a long way. It may appear to be very small touches but in the end it helped get the company an account worth several thousands of dollars each year. The new client specifically commented on how ‘the receptionist is a keeper’ and how they should treat me well. All in all someone else when asked to ‘give someone special treatment’ may have just gotten them a regular coffee, and made pleasant conversation with them, asked them if they needed anything etc. This is how I chose to go above and beyond and make it into a different experience. I did some preliminary research which went a very long way in making someone feel very good about coming to our firm for his legal needs. What does going above and beyond mean to you? To what level can you take it? Ok So What’s the point of this question? It’s to see what ‘initiative’ means to you as a potential employee? Where did you see something that wasn’t working and you made it work? Something that needed improving and so you improved upon it? Something that wasn’t getting done, and so you did it? No one asked you to, no one told you to, but you saw something was missing and you took action yourself. That’s initiative. So the reason they ask this is to see, how you have done it in the past? The opposite of initiative is doing nothing, saying things like ‘That’s not my job’. This question is a great opportunity to tell a story that shows off a time when you took initiative and it was a success. I was working at a tech company and we had a great VP of Engineering, he was the best boss ever, he was supportive, always chill, never got angry if someone made a mistake, he just dealt with things accordingly, he was good at making unpopular decisions yet he was still able to maintain the coolness factor of being a good boss and he always made us laugh. I’d been working with him for 2 years and we were having a big company event and since he is management and he isn’t able to win awards that employees are eligible to win. I decided I’d see if I could get everyone to pitch in for a surprise award for him. (This is an example of seeing someone that I thought deserved to be recognized and making it possible) and in the second step I explain the actions I took to to do it. The first step of this story is observing and becoming aware of something without anyone having told you. Something that came from the heart, or something that came out of need. I pitched my idea to the CEO, and he fully supported me. He said he would be happy to help out by paying for his wife to fly over (to where the event was) and surprise him even more with his wife coming in. So I collected all the money from everyone and I got him this award. So the result, in this case, was: On the night of the awards, he was the one presenting them, and he was wrapping up the ceremony where he said, ok that’s it everyone eat drink and be merry, when the CEO said: Wait there is one more thing! And we did the presentation of his award. Highlight anything interesting about the story – there were too many interesting features to name but I went with this one: “I think he may have shed a tear or two (although he would want to admit it)” – that really paints the picture of the impact that this action had. Can you think of a time when you observed something that no one else did, and took action on it? This question is designed to see if you’re thinking about cost savings when you can. If there’s an opportunity to save money somewhere, did you see it? And did you take advantage of it? They want to know how you think, to see whether you’ll be thinking that way for them if you’re hired. Will you be looking for ways to save money where you can? You answer it by telling a story. Use The STAR Interview Method Formula which we’ll go through here. STAR Interview Method Stands for Situation Action Result and Interesting Features. You want to tell a memorable and interesting story that includes enough detail to paint a picture. The story should be pretty concise, you want to keep it short and sweet, and paint the picture of the scenario first. For example: We were replacing everyone’s desks with sit/stand desks, as that’s a new thing now a days. Sitting is the new smoking. So I was asked to order a certain type of desk from a specific company and slowly start upgrading everyone’s desks. “I looked at the company’s pricing on these desks and thought to myself, hmm they charge quite a bit for shipping and assembling, I wonder if there’s another way to get this done for less money? How did it work out? What was the end result? My boss was super pleased with me finding this other company, and when I showed her that we’d be saving over $1000 in total on all shipping and assembly costs after the entire job was done, she was very impressed. Anything you learned, what did you take away from the experience, any nuggets of wisdom to share? Basically anything that makes the story more interesting to listen to. So when I mentioned ‘Sitting is the new smoking’ that was an interesting feature. Also another example might include something personal about yourself if you’re geared towards cost saving in your own life like: “My dad was always having me look for the sales, in fact when we shopped for groceries when I was little, I was always looking out for the sale price tags” So my mind is just wired that way to always look for the best possible price. What is your thought process, and level of awareness when it comes to saving money or cutting costs? How do you take action on saving money? What was the end result. Zero in on what you learned – keep it interesting – for example: I learned that I’m pretty good at researching and doing price comparisons, and it may not always be on the price itself that you save the money, (shipping and handling, extra hidden fees, an employee’s time are all ways that you can save, and there are even more than that). How do you think about cost savings? How many different ways can you think of to save costs, time or resources? The reason prompts like these are used in job interviews is that hiring managers want to know how you respond to pressure. For this particular question, you can incorporate a story from work, school or volunteering. The person interviewing you wants to see your ability to turn around a situation that wasn’t going well with a group of people. Your story should start with how the team was failing and how you played a part in getting everyone together and turning it around. Your response here will demonstrate people skills, communication skills and overall resourcefulness. If you’ve been tuning into my other blog posts, you might have guessed how this is going to work—we’re going to use the S.A.R.I. (STAR Interview Method) Formula. You might have heard this technique referred to as S.T.A.R. or S.A.R. It’s all the same, and it all works. The reason it works is that you’re developing a structured response, and the steps are easy for you to remember. For this one I’ll give you an example from my own work experience. Setting the stage here means talking about the team mission and why it looked like the team was on its way towards failure. The meat in the middle describes the steps taken to get the team back on track. In your own story, you’ll want to describe the solutions you came up with and how you were able to implement them. In my case, everything worked out well. What were the results of your actions? You’ll want to explain how the team came together to see the project through successfully. Whenever possible, highlight what you’ve learned from your experience. In my case, I learned that opening up communication together finds solutions to problems! In The Ultimate Behavioral Interview questions and answers Guide, you’ll get a breakdown of the S.A.R.I Formula seen here. You can dive into the psychology behind the S.A.R.I. (STAR Interview Method) Formula and follow along step-by-step examples of the top 10 most common situational questions asked in job interviews. You’ll read real-life examples from the lives of me and my clients to inspire you in the creation of your own stories. Included with The Ultimate situational interview questions Q&A Guide are fill-in-the-blank templates for each question. You can simply pop in your answers, and you’ll be off to the races! And if you’re still stuck (because preparing your own stories can be tough), the guide also includes 25 questions for you to ask yourself to come up with your own answers more quickly and effectively. Plus, it’s all wrapped up in a beautiful workbook that was created specifically to help you prepare for your next interview. If you work through this guide and participate in the exercises, you will be ready for any situational question that comes your way—that’s my promise to you! of behavioral interview Questions, this is insanely helpful! You have touched on a lot of good points! Anyways, keep it up. I am going to be looking for a coach soon. I was wondering if you have any advice for the people who don’t know what their purpose is in life but they really want to find out. What are some actionable steps to take toward discovering your passion? This is an insane amount of in-depth free info. Thanks so much for the amazing level of detail.